A computed tomography (CT) or computerized axial tomography (CAT) scanner is a medical imaging tool that provides clear pictures of the internal structures of the body. Utilizing a beam of x rays and a radiation detector, it supplies data to a computer, which then constructs a three-dimensional image. The CAT scanner is made up of various complex electronic components, which are produced by various subcontractors and assembled into a complete unit by the scanner manufacturers. First developed in the early 1970s, steady technological improvements have made this type of scanner an invaluable radiologic diagnostic device. The invention of the CAT scanner was made possible by Wilhelm Roentgen, who discovered x rays in 1895. Around this time, various scientists were investigating the movement of electrons through a glass apparatus known as a Crookes tube. Roentgen wanted to visually capture the action of the electrons, so he wrapped his Crookes tube in black photographic paper. When he ran his experiment, he noticed that a plate coated with a fluorescent material, which just happened to be lying nearby the tube, fluoresced or glowed. This was unexpected because no visible light was being emitted from the wrapped tube. Upon further investigation, he found that indeed there was some kind of invisible light produced by this tube, and it could penetrate materials such as wood, aluminum, or human skin. After this initial finding, Roentgen quickly realized the importance of his discovery to medicine. Using x rays, he determined that it was possible to create an image of structures beneath the skin. To this end he published the first x ray, an image of his wife's hand. He received the first Nobel prize in physics in 1901 for this discovery. The first documented use of x rays for an actual diagnosis in the United States occurred in 1896. Dr. Gilman Frost and his brother, who was a physicist, used them to determine the severity of injuries suffered by a young boy who had an ice skating accident. This x ray was taken in the physics laboratory of Dartmouth College. As the field of radiography expanded, x-ray technology steadily improved. One of the major limitations of conventional x rays was that they lacked depth; therefore many internal structures were superimposed on each other. With the help of computers, scientists developed methods to solve this problem. One such method was computed tomography (CT), or computerized axial tomography (CAT). The first CAT scanner was demonstrated in 1970 by Godfrey Hounsfield and Allen Cormack. Over the next two decades, significant advances were made in scanner design, which have resulted in the high quality imaging scanners used today. CAT scanners, like all other x-ray machines, employ x rays to produce images of internal body structures. X rays are a type of ionizing radiation that is capable of penetrating solid materials to differing degrees, depending their density and thickness. In conventional radiology, an image is produced by placing a detector, such as a photographic film, behind the patient and then directing a beam of x rays toward it. The radiation passes through the patient's body and interacts with the film. Since x rays that strike the film produce dark areas after processing, body structures that are easily penetrated by x rays, such as skin, show up as dark regions. Other structures such as muscle, soft tissue, and organs allow different amounts of x rays through them and show up as gray areas. Bones, which do not allow x rays to pass through them, show up as bright white areas. The images produced by conventional film x rays are often fuzzy because many of the internal structures are superimposed on each other. Tomography was developed to reduce this fuzziness and allow for the imaging of specific areas in the body. Early tomographic methods involved the simultaneous moving of the x-ray generator and the detecting film in opposite directions. As the two units move horizontally, only body structures that lie in a specific geometric plane will allow x rays to consistently pass through to the detector. 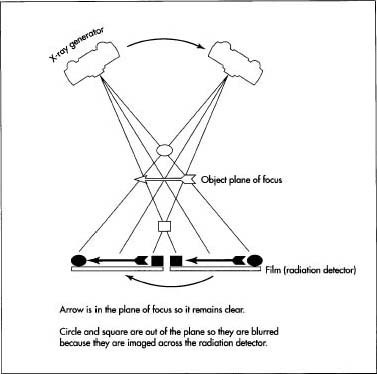 In this way, these structures show up clearly on the film, while structures outside the plane are blurred. The image produced by this type of radiology is parallel to the long axis of the body. Computerized axial tomography and computerized transaxial tomography represent a more complex and improved form of conventional tomography. The images are produced by rotating the x-ray generator and detectors around the patient in a circle. The amount of attenuated remnant radiation emitted from the body at various angles is measured and sent to a computer instead of being recorded directly on film. The computer then runs a series of complex algorithms to reconstruct the image, which can then be displayed on a monitor. Unlike conventional tomography, the image produced by computerized transaxial tomography is a cross section of the body and is called a transaxial image because it is perpendicular to the body's long axis. X rays are called ionizing radiation because they are able to interact with and change certain types of matter, such as molecules in the body. While this is certainly a significant health risk to humans, the benefits of using x rays in medicine are overwhelming. However, care is taken by workers in the medical field to limit the amount of exposure to themselves and to patients. 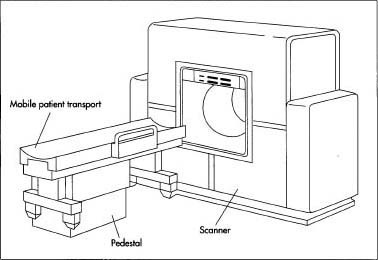 The CAT scanner is made up of three primary systems, including the gantry, the computer, and the operating console. Each of these are composed of various subcomponents. The gantry assembly is the largest of these systems. It is made up of all the equipment related to the patient, including the patient support, the positioning couch, the mechanical supports, and the scanner housing. It also contains the heart of the CAT scanner, the x-ray tube, as well as detectors that generate and detect x rays. The x-ray tube is a special type of vacuum-sealed, electrical diode that is designed to emit x rays. It is made up of two electrodes, the cathode and anode. To produce x rays, a filament in the cathode is charged with electricity from a high voltage generator. This causes the filament to heat up and emit electrons. Using their natural attraction and a special focusing cup, the electrons travel directly toward the positively charged anode. X rays are emitted indiscriminately when the electrons strike the anode. The anode, which can be rotating or not, then conducts the electricity back to the high-voltage generator to complete the circuit. To focus the x rays into a beam, the x-ray tube is contained inside a protective housing. This housing is lined with lead except for a small window at the bottom. Useful x rays are able to escape out this window, while the lead prevents the escape of stray radiation in other directions. Unlike other radiological devices, the detectors in a CAT scanner do not measure x rays directly. They measure radiation attenuated from the body structures due to their interaction with x rays. One type of detector is an ideal gas-filled detector. When radiation strikes one of these detectors, the gas is ionized and a radiation level can be determined. quick computer is particularly important because it greatly influences the speed and efficiency of the examination. Since the computer is so specialized, it requires a room with a strictly controlled environment. For example, the temperature is typically maintained below 68°F (20°C) and the humidity is below 30%. The operating console is the master control center of the CAT scanner. It is used to input all of the factors related to taking a scan. Typically, this console is made up of a computer, a keyboard, and multiple monitors. Often there are two different control consoles, one used by the CAT scanner operator, and the other used by the physician. The operator's console controls such variables as the thickness of the imaged tissue slice, mechanical movement of the patient couch, and other radiographic technique factors. The physician's viewing console allows the doctor to view the image without interfering with the normal scanner operation. It also enables image manipulation, if this is required for diagnosis and image storage for later use. For this type of data storage, magnetic tapes or floppy disks are available. The design of a CAT scanner improved incrementally over time. The original CAT scanners utilized a thin, pencil beam of x rays and took 180 readings, one at each degree of rotation around a semicircle. The x-ray generator and detectors moved horizontally for each scan and then were rotated one degree to take the next scan. Two detectors were used, so that two different images could be generated from each scan. The drawback of this system was lengthy scanning times. A single scan could take up to five minutes. Designs improved as more detectors were added and the x-ray beam was fanned out using a special filter. This significantly reduced scanning time to about 20 seconds. The next major design improvement resulted in the elimination of the horizontal movement of the generator and detector, making it a rotate-only scanner. More detectors were added and grouped into a curvilinear detector array. The detector array eventually was designed to be stationary, and the resulting scan time was reduced to one second. A wide variety of materials, such as steel, glass and plastic, are used to construct the components of a CAT scanner. Some of the more specialized compounds can be found in the patient couch, detector array, and the x-ray tube. The patient couch is typically made from carbon fiber to prevent it from interfering with the x-ray beam transmission. CAT scanners use X-ray technology to create three-dimensional images of the body's internal structures. Images are obtained by rotating the x-ray generator and detectors around the patient. This information is fed into a computer, which reconstructs images of the body structures within its plane of focus. The detector array of more modern scanners uses tungsten plates, a ceramic substrate, and xenon gas. Tungsten is also used to make the cathode and electron beam target of the x-ray tube. Other materials found in the tube are Pyrex. glass, copper, and tungsten alloys. Throughout many parts of the CAT scanner system, lead can be found, which reduces the amount of excess radiation. CAT scanner manufacture is typically an assembly of various components that are supplied by outside manufacturers. The following process discusses how the major components are produced. 1 The x-ray tube is made much like other types of electrical diodes. The individual components, including the cathode and anode, are placed inside the tube envelope and vacuum sealed. The tube is then situated into the protective housing, which can then be attached to the rotating portion of the scanner frame. 2 Various detector arrays are available for CAT scanners. One type of detector array is the ideal gas-filled detector. This is made by placing strips of tungsten 0.04 inch (1 mm) apart around a large metallic frame. A ceramic substrate holds the strips in place. The entire assembly is hermetically sealed and pressure filled with an inert gas such as xenon. Each of the tiny chambers formed by the gaps between the tungsten plates are individual detectors. The finished detector is also attached to the scanner frame. 3 To create the large amount of voltage needed to produce x rays, an autotransformer is used. This power supply device is made by winding wire around a core. Electric tap connections are made at various points along the coil and connected to the main power source. With this device, output voltage can be increased to approximately twice the input voltage. 4 The control consol and computer are specially designed and supplied by computer manufacturers. The primary model building computer is specifically programmed with the reconstruction algorithms needed to manipulate the x-ray data from the gantry assembly. The control consoles are also programmed with software to control the administration of the CAT scan. 5 The final assembly of the CAT scanner is a custom process which often takes place in the radiologic imaging facility. Rooms are specially designed to house each component and minimize the potential for excessive radiation exposure or electric shock. By following specific plans, equipment installation and wiring of the entire CAT scanner system is completed. As with all electronic equipment, quality control tests are an important part of CAT scanner manufacturing. The scanner manufacturers typically rely on their suppliers to perform basic quality tests on the incoming components. When sections of the scanner are assembled, visual and electrical inspections are performed throughout the entire process to detect flaws. In addition to the quality specifications set by the manufacturers, the United States Food and Drug Administration (FDA) has regulations that require manufacturers to perform specific quality control tests. Examples of these tests include calibration tests of the x-ray tube, mechanical tests of the patient table, and standardization tests of the visual output. Research for future CAT scanners is focused on four basic goals, including the production of better quality images, reducing the amount of patient radiation exposure, optimizing computer reconstruction algorithms, and improving CAT scanner design. Various methods of achieving these aims have already been attempted. To improve image quality, some scanners incorporate unique movements of the x-ray tube, the detector, or both. Others change the position of the patient. Faster scanners are being developed to reduce patient exposure time. Different kinds of computer algorithms have been developed for a variety of examinations. Future CAT scanners will likely incorporate most of these new developments, along with a continuously rotating x-ray tube and detectors to provide the clearest and safest imaging procedure possible. Bushong, Stewart. Radiologic Science for Technologist. Mosby, 1993. Curry, T.S. Christenson's Physics of Diagnostic Radiology. Lea and Febiger, 1990. Tompson, Michael. Principles of Imaging Science and Protection. W.B. Saunders Co., 1994. "Quality Assurance for Diagnostic Imaging Equipment." National Council on Radiation Protection and Measurements, 1988.